I have a mad, obsessive love with cheese. I spent a year working with just cheese (and olives, and chocolate, and coffee…all the best things in life), and learned quite a bit. Shortly, dear reader, you will see more and more posts expounding on the merits of cheese and my favorites in each category. But today is not the day for a primer on the types of milk, the aging process, the beauty of mold. Today is a day that I am procrastinating, putting off writing something that I have to write by writing other things. I have also cleaned my apartment, re-arranged all of my furniture, and looked up synonyms for procrastinate. Dally, dawdle, defer, give the run around, goldbrick, hang fire, hesitate, hold off, lag, linger, loiter, poke, postpone, shilly-shally, stall, stay, tarry, temporize, and be dilatory. In case you were wondering. But I digress/postpone/hang fire…back to Mt. Tam. It is one of my favorites. From the second I tasted it in the Ferry Building in San Francisco years ago, I knew I was smitten. Just North of the San Francisco Bay, Mt. Tamalpais rises like a monument to Northern California’s natural beauty. 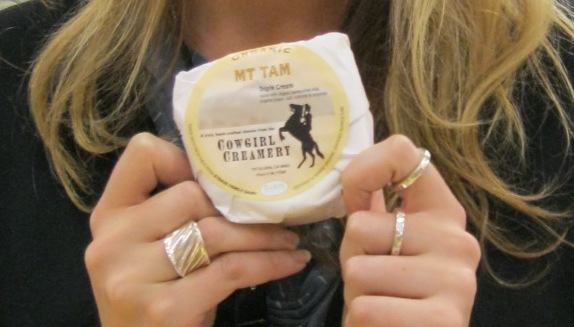 In deference, Cowgirl Creamery named its signature cheese MT TAM. It’s a smooth, creamy, elegant, triple-cream – made with tasty organic milk from the Straus Family Dairy. 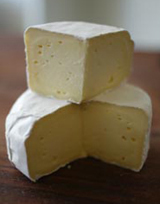 MT TAM is firm, yet buttery with a mellow, earthy flavor reminiscent of white mushrooms. Now, I may still be learning about wine, and I may yet be a novice at cooking a good steak. I may not know when to give up or when to shut up or when I’ve had too many Army/Navy’s, but if there is one thing that I know, it is cheese. And I do not agree with that description. Mt. Tam tastes like the beach. It is salty and biting, almost briney at a certain stage but always with that fresh creamy note of ocean air. As it ages, the ammonia pulls at your nose more and more. When it is young, is has the texture of firm marscapone. The rind is mild but- and here I will agree with the cowgirls- it has a note of mushrooms. Another term for procrastinate: “eat some Mt. Tam.” As in, now that my apartment is clean I guess I’ll have to eat some Mt. Tam to avoid my actual work.